AFTER more than 60 years of research, the first nuclear powered aircraft is cleared for its take off. In place of conventional jet fuel, the nuclear energy will propel the aircraft. Using this power, an Unmanned Aerial Vehicle could remain on station for months. The next logical step would be a manned version that could operate as long as the crew had food with them. THE biomedical scientists 15 years ago set out on biology’s most important mapping expedition — the human genome project. After the identification of DNA as the genetic material and the basis of heredity in most life forms, the scientists were interested to identify the full set of genetic instructions which we carry. A team of 27 U.S. marine scientists beginning an intensive programme of exploration at the Lau Basin in the South Pacific has discovered a new cluster of hydrothermal vents along a volcanically active crack in the seafloor. When we are going upward on a mountain we are going nearer to the sun but it is becoming cold rather than hot, why? AFTER more than 60 years of research, the first nuclear powered aircraft is cleared for its take off. In place of conventional jet fuel, the nuclear energy will propel the aircraft. Using this power, an Unmanned Aerial Vehicle (UAV) could remain on station for months. The next logical step would be a manned version that could operate as long as the crew had food with them. A jet engine is a simple mechanical machine, working on Newton’s law of action and reaction or conservation law of linear momentum. The fuel and air are mixed in a specific ratio, then compressed and finally ignited. The ignition of fuel produces burnt gases, which move rapidly through the nozzle of the aircraft, propelling it forward. Like conventional aircraft, the nuclear powered aircrafts will also use the jet fuel when it reaches at cruising altitude i.e. 45,000 feet and above trans-Atlantic airline traffic, the engine will be switched over to a system working on hot air created by the nuclear reactor. The nuclear aircraft are in their infancy but the work on them had started way back in 1940s. The scientists at that time got success in developing nuclear submarines which are still in use. Since then, they have also been trying the ways of using nuclear energy from fission reactor to power airplanes. But these air planes never flew because of two reasons. First, a lot of nuclear waste of longer half life is produced, whose disposal becomes hazardous. Secondly, the energetic neutrons streaming out of the reactor are of grave concern. Owing to their greater penetration power, a very thick shielding is required to protect the crew. This thick shielding makes an airplane too heavy to carry other loads or weapons. In the late 1990s, the scientists at the University of Texas in Dallas made an unexpected discovery about the hafnium isomer known as hafnium-178. When the hafnium-178 was bombarded with “soft” X-rays like the dentists use to examine the teeth, a burst of gamma rays was released. This burst was 60 times powerful than the X-rays that were being used to trigger them. The energy output to input ratio is 60 (New Scientist, print edition, 3 July 1999). At sub-atomic level, the bombardment of hafnium-178 with X-rays is very similar to triggering a small avalanche by tossing a snowball onto a snow-covered roof. This new type of reactor is called quantum nucleonic reactor which neither splits nor fuses the nuclei. Rather, it creates its power by triggering a massive release of gamma energy. In building a nuclear aircraft, the engineering division faces daunting challenges. The U.S. Air Force and Northrop Grumann are jointly working on nuclear powered aircraft. 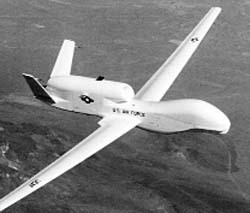 According to a report in Popular Mechanics, a UAV has already been built, named as Global Hawk and the work on manned nuclear powered aircraft is going on at war level. Captain Christopher, who worked on hafnium-178 reactor at Wright-Patterson Air Force Base in Ohio, says that the first quantum nucleonic reactor will be put in a specially designed room in the tail section of the aircraft, called “hot cell”. This hot cell area will be well insulated from main control room and crew room by 2700 pounds of radiation shielding. A solar cell or engine mounted generator will supply electricity to run a small X-ray machine. The “soft” X-rays strike a block of hafnium-178 and it triggers the drop in the energy levels of hafnium-178. The drop in energy levels will release a burst of gamma rays which will heat the core of a heat exchanger. The superheater air from the exchanger rushes into the jet engine performing same function as the expanding gas produced by the burning of jet fuel. For safety purposes, the conventional jet fuel will give initial thrust to the engine till it reaches at the cruising altitude. The hafnium fuelled reactor technology has numerous advantages over the fission reactor technology. Since it produces gamma radiation only and no neutrons, therefore, less thick shielding is required. As no destructive cascade energy is released, then the power generation can be tightly controlled. In case an accident occurs, there is less environmental concern than with fission as hafnium-178 has half life of ~ 31 years compared to thousands of years for fission reactors. Thus, the depleted hafnium-178 will pose no serious long term disposal problems of nuclear waste. Unlike uranium or plutonium, hafnium-178 cannot support chain reaction, therefore, it cannot be smuggled to make any rogue nuclear weapons. Naturally, the hafnium-178 reactor technology will probably see its first application in the production of UAVs first and then manned aircraft. This technology could find its way in commercial power generation that could take care of energy needs in future. To achieve it, an international project by the name of human genome project (HGP) was started in 1990 to decipher the complete text written in the language of the heredity chemical DNA, which ended last year. HGP has been considered as one of the most ambitious and promising project ever attempted by medical scientists. It has been called as the “Everest: of modern biology and has been paralled with the “Apollo Programme” to put a man on the moon or Wright Brothers’ first flight at Kitty Hawk. The HGP involved decoding of the complete human genetic sequence the way it is written in the form of three billion heredity alphabets A (adenine), T (thymine), G (guanine) and C (cytosine) which constitute the human genome. These alphabets are the building blocks of the heredity chemical DNA. The researchers, through the HGP, were also interested to know the total number of genes and their locations in human DNA. The studies so far have revealed that major (98%) part of the genome is not made up of genes but of “junk or filler DNA”. The genes constitute only 2% of our total genome that is to say that you and I are the product of functioning of around 30,000 to 50,000 genes, not all of them at once of course. It is surprising to know that even laboratory mice has approximately the same number of genes as we have and the function of 50% of discovered genes in our case is still unknown. The male chromosome (chromosome Y) has the fewest genes (231) and the chromosome I has the maximum genes (2969). The largest human gene is that of Dystrophin (contains 2.4 million heredity alphabets) which forms dystrophin protein that gives strength to our muscles. HGP studies have shown that certain genes are evolutionary conserved as these human genes share similarity with fruit fly, worm or bacterial genes!! The human genome sequence is almost 99.9% identical in all individuals and there are three million locations where single heredity alphabet differences occur, which account for 0.01% difference in our genetic makeup from each other. These variations hold the key to our responses to medications, infections and susceptibility to diseases such as cancer, diabetes and heart diseases. The human genome project studies have also pinpointed various genes associated with colon cancer, breast cancer, diabetes, deafness, blindness and muscle diseases. In fact, a new gene associated with stroke was very recently reported. The specific risk factors for various illnesses too are just now becoming better defined on the basis of contents of the genome. The finished sequencing of the human genome is expected to spark a boom in new treatment, customised or tailored drug therapy to individual genetic profile, early diagnosis of diseases and possibly the prevention too. Integral to HGP are similar efforts to understand the genome of hundreds of other organisms such as mice, fruitfly, round worms etc. which are commonly used in biomedical research. These organisms serve as genetic models for health and diseases. The comparison of the functioning of the rat, mice and human genomes is starting to shed light on how it works in health and diseases. Interestingly, the 17th chromosome in mice shares similarity in large parts to the 11th chromosome in human beings. Also integrated to HGP is the worldwide effort to documents genetic variations of human races such as black, white, Caucasian. Mongolian etc. by carrying out the human genome diversity project (HGDP). The HGP has raised complex ethical and policy issues too for individuals and society, such as who owns and controls the genetic information? Is genetic privacy different from medical privacy? Who should have access to personal genetic information and how will it be used? Can the genetic data be used in employment, marriage counselling and insurance applications? How the personal genetic information will affect self identity and society’s perceptions? Do our genes influence our behaviour and can be control it? Who will check the genetic manipulations? To address these issues, a “working group” has already been formed in the US to look into ethical, legal and social implications (ELSI) of the HGP & subsequent development for policy options for public consideration. The HGP has revealed a wealth of information and some early surprises but much still remains to be deciphered. We still have very little understanding of how the information in DNA creates, sustains and reproduces living systems. The true pay off from the HGP will be the ability to better diagnose, treat & prevent diseases and the most of these benefits to humanity still lie ahead. Truly speaking, the more we learn about the human genome, the more there is to explore. A team of 27 U.S. marine scientists beginning an intensive programme of exploration at the Lau Basin in the South Pacific has discovered a new cluster of hydrothermal vents along a volcanically active crack in the seafloor. About a mile and a half down, the basin could hold answers to questions about the origin of life on Earth, say the scientists, whose plans for their “South Pacific Odyssey” include an unprecedented number of research expeditions to this geologically unique “back-arc basin” during the next two years. This major undertaking will require the coordinated efforts of dozens of large research groups, numerous research expeditions, and the deployment of a wide array of specialized deep-sea research tools,” said Penn State Professor of Biology Chuck Fisher, chair of the NSF-funded Ridge 2000 research initiative, which is behind this effort. “Because of the unusual properties of the ocean crust in the Lau Basin, we can expect to discover new species there—species that perhaps will hold new and unique secrets to share with us,” Fisher said. Over the past decade, the development of nanomaterials has progressed rapidly toward their eventual use in products ranging from solar cells to medicines. However, tests of possible toxic effects of these substances on human health and the environment have been slow to get under way. Recently, an experiment raised concern about the soccer-ball-shaped carbon molecules commonly known as buckyballs. Now, other chemists confirm that finding and report an innovation that might disarm potentially toxic buckyballs. Most hill stations are about two kilometers above sea level - that is about the altitude of Shimla, or Ooty. Distance of the Sun from the Earth is 250 million kilometers. Surely, this much change in distance cannot make any difference. In any case when we go up a mountain we are not moving towards the sun at all times of the day. The reason for the lower temperature at high altitude is very different. You must have noticed and heard that as you go up the air becomes thinner. The pressure of the atmosphere decreases. The pressure is due to the mass of the air above. At sea level this is about 1000 grams on every centimeter square. This pressure is reduced as we go higher because there is less of air on top. Around the height of Shimla or Ooty it is reduced to about 800 grams. That is reduction by one fourth. When the pressure is reduced the molecules of air move further apart. For doing so they have to work against the attraction between them. Therefore they lose energy and the air becomes cooler. This is true for most gases. You can do simple experiments to prove it to yourself. You must have noticed that when you blow out air from you mouth, fast and with your lips compressed, the air feels cold on your hand. If, on the other hand, you breath out slowly with your mouth open the air feels warm. In the first case the compressed air is expanded while in the second case it comes out at same pressure and temperature it is inside your lungs. If your friend or your father does not spank you afterwards you can try another experiment. Just press the valve pin in the nozzle of a car or motorcycle tire and feel the temperature of the air coming out. You will find that it would be cool, if not cold. The only way we can have a stable atmosphere is to have the air get colder as we go high. This is the basic reason for it being colder on the hills. The air is thinner. There are other considerations that alter things a bit but we will let them be at the moment. Why are the fingerprints of different persons different? Why should it be surprising that fingerprints of different persons are distinguishable? The reverse would have been more surprising by far. After all, everyone does not look exactly alike. We can recognise people. Just think how we are put together, molecule by molecule. It is truly amazing that we come out so similar, though not exactly the same. We should also remember that there is always some slight difference between the DNA of different persons. This arises from inheritance. Mutations over a long period of time and mixing of genes does bring about some differences, some marks of identity. How does a helicopter take off from the ground? How does it move forward? A helicopter has large rotating blades driven by a powerful engine. They are angled in a way that at takeoff time they push a lot of air down with a great force. This gives the helicopter an upward thrust. The speed of rotation and the cutting angle of the blade determine the lift. You might have noticed that helicopters also have a small fan mounted near the tail on a horizontal axis. This helps to rotate the helicopter. The forward movement can be obtained if the blades of the rotor are adjustable and are programmed in an appropriate way to provide a small forward component to the thrust of the main rotor.